This is the last Ironcraft challenge that will be thrown for quite a while. I want to thank Kat for all the organizing, the choosing of themes and for being an inspiration to me. I've enjoyed the challenges and learned so much from them. I wish Kat the best in her new ventures and hope that our paths will cross again some time. Like they say, I'll see you down the road. For this last challenge, I choose to show these little salt shakers turned soap dispensers. In our home, we don't have Christmas stocking. Instead, we have a New Year's Bag. In the past when the children were small, the sheer volume of gifts would eclipse anything you could put in a stocking so we decided to postpone it to New Year's day and put them into bags. Mostly filled with chocolate and toys, the kids looked forward to opening them every year. This year's bags are still filled with goodies and items that they will need like soap, underarm and the like. 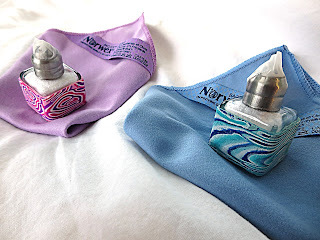 I found these Norwex face cloths that take away makeup without soap or harsh creams. The soap that is included is to wash the cloth after you are done. You put it in a shaker so as to get a very small amount of the soap and that will do the job. My daughter goes through many makeup wipes in a month and the cost of the cloths was about what I spend in a month so I figured I couldn't lose. I made a bag for my son's girlfriend too and she got one too. I covered the shaker with their favorite colors of polymer and it can be something that will save them money, will be better on their face and that they can keep for a long time. The Norwex products are wonderful and long lasting. So, here it is. I wish all my fellow Ironcrafters a wonderful new year and more crafting and challenges on down the road. ps. The top of the shakers are covered in tape. I needed to put them in the New Year's Bag and I didn't want them to spill the soap.